lverawrites My collection of free short stories. Because nothing else in life is free. L. Vera: I would like to start off by saying how much of an honor it is to have you on my blog and you would be the first person I have ever interviewed. K. A. Laity: I will be gentle with you. I am pleased to be your first interview. I hope I do not scar you for life. L. Vera: One thing I had noticed about you was that, besides being published in a plethora of outlets, is that you have your own Wiki page. How awesome is that? K. A. Laity: LOL, I think one of my friends started that. I suspect no one else has looked at it. I should make my students update it. I make them change the college’s page. L. Vera: So obviously you have been a part of other collections, and anthologies. I know Burning Bridges is coming out on May 1st, and you have a short story called “Horse Clock” within its pages. What makes being involved with this collection different then the others? K. A. Laity: The primary appeal of this anthology is joining the gang who had the good taste to drop a publisher who showed himself to be a reprobate without morals. We’re known by the company we keep — and the company rocks. L. Vera: That was definitely a learning experience for us all. So what will we find inside the story, “Horse Clock”? K. A. Laity: We will find that the world is much more elastic than we have been taught to believe. Everything is alive. Sometimes you can find a god on your mantelpiece. L. Vera: I’m already excited to read it. What kind of thinking went behind its creation? K. A. Laity: Actually the first thing to come was the picture (located on the right). I rented the townhouse I live in sight unseen, so inherited many interesting things including the clock on the mantelpiece. I took this picture and wrote the opening lines for the story when I posted it. A friend asked if there would be more to the story. I hadn’t really thought about it, but then the idea for BURNING BRIDGES developed and I thought, ah ha! L. Vera: And the title, is very intriguing. So which came first, the title or the story? K. A. Laity: The story came before the title, the clock came first of all. No idea where the other horse went, but i had fun thinking about it. L. Vera: What should we expect from you in the future? K. A. Laity: I just turned in the final (I hope) edits for my next novel OWL STRETCHING which will be out later in 2012. I have a story “It’s a Curse” in Mr B’s DRUNK ON THE MOON anthology and “Chickens” in Matt Hilton’s ACTION anthology. I have a couple of non-fiction collections coming soon, too. My website (www.kalaity.com) will list things as they come out. L. Vera: Thanks for the quick interview. I can already see Burning Bridges hitting the #1 free spot on Amazon on May 1st. I look forward to reading “Horse Clock” and I’m sure so is the rest of the Amazonian readers out there. Also, check out K. A. Laity at her blog. This entry was posted on April 24, 2012 by lverawrites. It was filed under Interviews and was tagged with anthology, burning bridges, free, Horse Clock, interviews, K. A. Laity, L. Vera, short stories, short story. Thanks for the interview. I think I meant to mention that the vintage Sekhmet postcard propped against the clock is actually something I own. A friend sent me years ago. My comic with Elens Steier JANE QUIET features a bunch of Sekhmet worshippers who are trying to bring devastation into the world. Fun stuff. 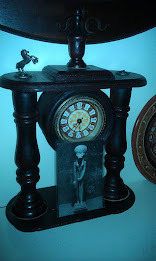 I love the idea of Horse Clock as a story… Great photo too! And I think you were sufficiently gentle here not to scar L. Vera for life after her first interviewing experience. Or even Elena… Gaah, I can’t type. Nice to find out more about ‘Horse Clock’ and what make Kate’s tick (:-) get it? No, okay. I’ll get me coat). This is a local blog, for local people! There’s nothing for you here! This is where I’ve been!!! The Monolith Update: Are You Ready To Die?